Not long ago, previously unpublished documents believed to have been written In Nostradamus' own hand began to surface among the wealthy upper crust of European society. 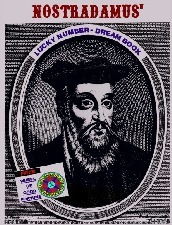 Among these documents were Nostradamus notes on the meaning of dreams as well as the lucky numbers which coincided with each dream. Also found among his elaborate maze of notes was a key as to how these dream interpretations could be applied to each and every person, regardless of which century they were to live. 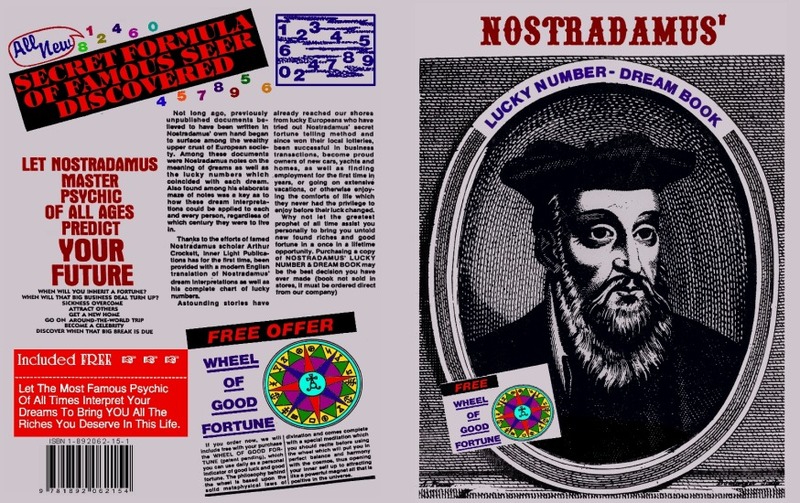 Thanks to the efforts of famed Nostradamus scholar Arthur Crockett, Inner Light Publications has for the first time, been provided with a modem English translation of Nostradamus' dream interpretations as well as his complete chart of lucky numbers. Astounding stories have already reached our shores from lucky Europeans who have tried out Nostradamus' secret fortune telling method and since won their local lotteries, been successful in business transactions, become proud owners of new cars, yachts and homes, as well as finding o employment for the first time in years, or going on extensive vacations, or otherwise enjoying the comforts of life which they never had the priviledge, to enjoy before their luck changed. Why not let the greatest prophet of all time assist you personally to bring you untold new found riches and good fortune In a once in a lifetime opportunity. Purchasing a copy of NOSTRADAMUS' LUCKY NUMBER & DREAM BOOK may be the best decision you have ever made. WHEN WILL YOU INHERIT A FORTUNE? WHEN WILL THAT BIG BUSINESS DEAL TURN UP?